New Zealand Rail Maps: Manawapou Viaduct Replacement 1914: SATISFACTORY TEST OF A NEW VIADUCT ON THE WELLINGTON-NEW PLYMOUTH RAILWAY: THREE ENGINES, WEIGHING 190 TONS, ON THE MOKOIA BRIDGE. 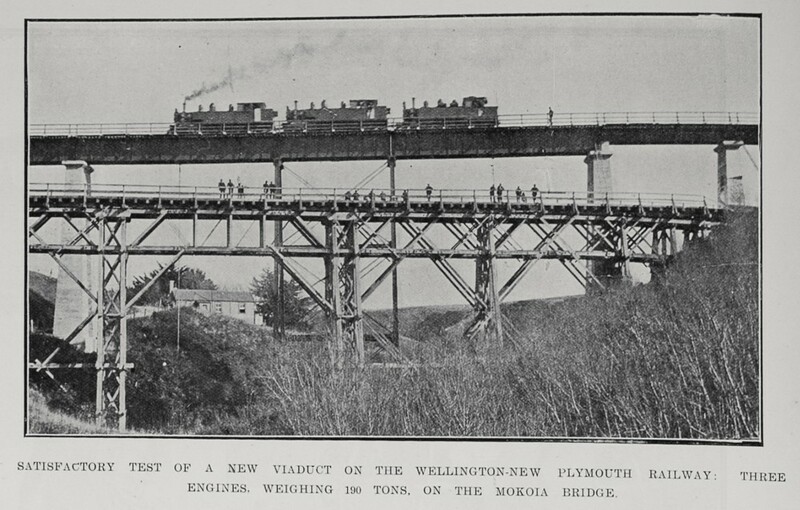 Manawapou Viaduct Replacement 1914: SATISFACTORY TEST OF A NEW VIADUCT ON THE WELLINGTON-NEW PLYMOUTH RAILWAY: THREE ENGINES, WEIGHING 190 TONS, ON THE MOKOIA BRIDGE. Both the old and new viaducts are shown in this picture.